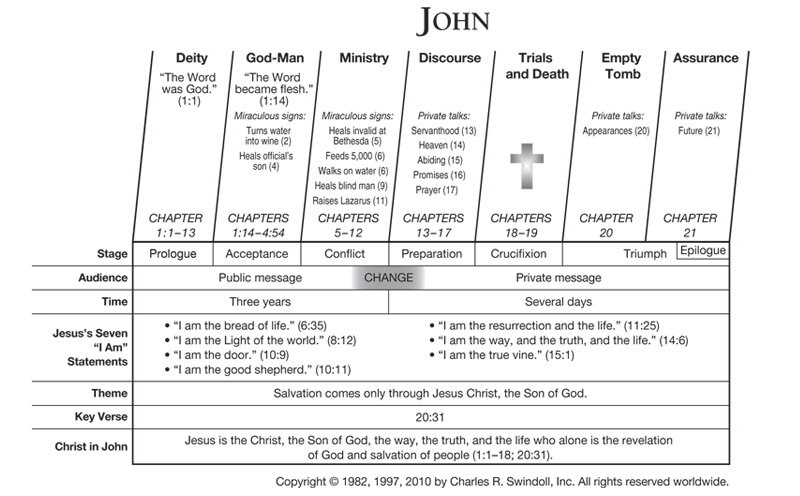 John used a variety of techniques to communicate to his readers the nature of Jesus. These include his citation of Jesus' seven “I am” statements, in which Jesus spoke of Himself in terms such as “the Light of the world” (8:12), “the resurrection and the life” (11:25), and “the way, and the truth, and the life” (14:6). Much of John's gospel (chapters 2–12) might be called the Book of Signs, as it recounts Jesus' performing of seven different miracles—such as the turning water to wine at Cana and raising Lazarus from the dead at Bethany. These miracles illustrate His identity as the Son of God. Jesus' identity as the divine Son of God sets Him apart from any other man who ever lived. He carries with Him the transcendence that comes only with God Himself. Therefore, His work on our behalf makes our salvation sure. Because He is God, His sacrifice on the cross has eternal implications, unlike the limited effect of the animal sacrifices in the Old Testament. Jesus, the God-man, has atoned for our sins. We can place our confidence in Him because of His divine nature. Find resources in the book of John in our resource library.